Pound shop on North End. 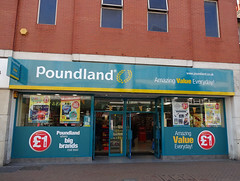 It was previously a branch of 99p Stores, but in March 2016 it was refurbished and reopened as Poundland. According to a photo on Flickr, by May 2009 it was a branch of 99p Stores (see also photos from December 2011 and from January 2016). This closed down around in early 2016, and as of March 2016 the premises were being refurbished to reopen as Poundland photo of handwritten sign, photo of printed sign. Last edited 2019-04-14 15:13:02 (version 36; diff). List all versions. Page last edited 2019-04-14 15:13:02 (version 36).